In 1897, a newspaper in New York ran perhaps the most famous editorial in American history. It included the words, “Yes, Virginia, there is a Santa Claus.” Some shelter animals are equally as skeptical as young Virginia. Their only wish is to get a home this holiday season. Giving an adopted pet? A pet is more than a holiday gift, it’s a beautiful addition to your family, and requires careful consideration. Can the person you’re gifting take care of the pet? Age, financial situation, and commitment are important to think about. DON’T SHOP, ADOPT: An adopted pet is a gift that changes many lives. Obviously, it gives the greatest gift of all to a shelter pet – a home. But bringing an adopted pet into your heart also changes the fabric of your home and family in more ways than can be imagined. Come in to one of our shelters and talk to our staff. They can help match you with a pet that meets your preferences and is a good lifestyle fit. We always recommend bringing the gift recipient in to help with selection. In addition, when you adopt from the Delaware SPCA, you know the pet is up to date on all his/her shots, and is spayed or neutered. It makes your job as gift-giver a lot easier. 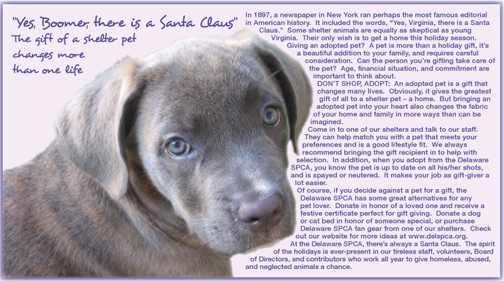 Of course, if you decide against a pet for a gift, the Delaware SPCA has some great alternatives for any pet lover. Donate in honor of a loved one and receive a festive certificate perfect for gift giving. Donate a dog or cat bed in honor of someone special, or purchase Delaware SPCA fan gear from one of our shelters. Check out our website for more ideas at www.delspca.org. At the Delaware SPCA, there’s always a Santa Claus. The spirit of the holidays is ever-present in our tireless staff, volunteers, Board of Directors, and contributors who work all year to give homeless, abused, and neglected animals a chance.